Lance is currently doing the rounds at Australia's Armageddon Expo, appearing at the Sydney event over the weekend. Our superb sisters in Ten-Thirteen fandom over at X-Files News were in attendance and have been blogging about the event with joyful abandon! 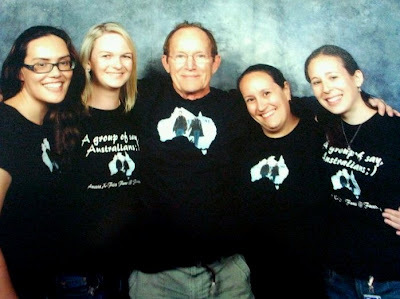 Their staff reporter Sandi Hicks writes about the fun they all had meeting with Lance and how they made him an honorary member of Aussie X-Files @ Facebook, such that he wore their gift of a t-shirt for the rest of the event. There's even a shout out for the Back to Frank Black team, so do be sure to check out the article in full. For our Australian readers who didn't make it to Sydney, Lance will also be attending the Adelaide event this coming weekend. Do tell Lance we sent you if you can make it, but be sure you've sent your letter to FX first! Our thanks as ever to everyone at X-Files News for the coverage, be sure to support their campaign for The X-Files 3 and here's to a bright future for all Ten-Thirteen fandom! 3 Responses to "Lance Attends Antipodean Armageddon"
It was truly one of the best experiences of my life, and I felt so honored that I was able to write about it for XFN. Lance was just too lovely, and I hope he enjoys the rest of his time down under. We are truly grateful for the time he spent with us. Thanks again for sharing, Sandi - sounds like you all had a great time! I am glad you guys had the chance to speak with Lance and find out what we already knew..what a fantastic human being he is! Thanks so much for sharing with us Sandi!! Coming Next Monday: Thomas J. Wright Week! "Not Bad For A Human" - Update!